Real Production Switcher Hardware: The video switcher is the heart of any live production, reliability and performance are paramount. 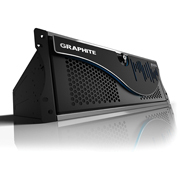 Graphite includes the pure production power of Carbonite – the world’s most popular mid-size production switcher – built into dedicated hardware. Enjoy all of Carbonite’s ‘big’ switcher features and never miss a beat. Real Graphics: Graphics can make or break a show and Graphite comes equipped with the best. The Ross XPression Motion Graphics system is used by top Hollywood Productions, Sports Teams and Networks. Graphite also includes XPression Clips – fully featured clip server channels. Crash-Proof Hardware: Traditional all-in-one systems can suffer from stability problems – a stutter in the middle of an important production or losing an element due to resources limits is unacceptable. Graphite eliminates these issues with its core processing built on dedicated internal hardware that contains the proven Carbonite engine. It even stays up while the computer reboots – ideal for mission critical applications. Proven System: Graphite is built on a solid foundation of dedicated components made by Ross, quality assured by a team of specialists to ensure a superior experience. Backed by Ross’ Legendary 24x7x365 Support: When you do need help, it is only a phone call or email away to Ross’ round the clock global technical support team. True All-in-One Solution: No external networking required for inputs and outputs, just plug and play into Graphite’s dedicated I/O. Single or Multi-User Operation: Graphite scales to meet the demands of various productions – run with a single operator or use separate operators for graphics and audio for larger, more complex productions. Supercharge control with event-specific custom Dashboard user interfaces. Growth Path: Regular firmware updates are downloadable from the Ross website. Easily expand Graphite’s capabilities with additional graphics channels, newsroom integration and automated production control. Two powerful MEs form the foundation of the switcher, which possess complete keying and effects capability. Four unique MiniMEs can be assigned anywhere in the system for additional dissolves and key layers independent of ME resources. MiniMEs perform wonderfully as uniquely keyed AUX outputs. Four independent MediaStore channels are available switcher-wide. Stills, logos, and animated graphics are played out from the on-board 8GB memory and can also be loaded via USB storage device. Refined memory and custom control system provides for simple set-up and operation of every component of Graphite: graphics, clips, stills, and audio. Fully integrated MultiViewers with selectable layouts, borders, tallies and UMD label displays for each source.